If finding art with a fresh perspective is something you enjoy, then the mixed media paintings by award-winning artist Cheryl Waale won't disappoint. As she was transitioning from the corporate world, Waale found inspiration in paint. Starting late and wanting to make up for lost time, she began enrolling in classes to develop her skill. She quickly realized traditional methods were great for fundamentals, but didn't offer much innovation. "When I go to art festivals or galleries, I'm always looking for something fresh and different. I knew I wanted to be that kind of painter," reflects Waale. "I wanted a signature style that felt like 'me.' In the beginning, I wasn't sure what that meant." 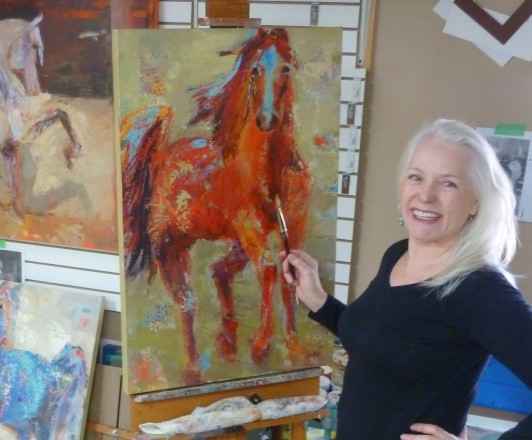 Through independent study with artists she admires, good coaching, fearless experimentation and a lot of brush mileage, she has developed recognizable style - turning ordinary subjects into extra-ordinary works which offer many layers of color and texture. "I've been told my paintings appear to have layers of stories embedded in them." The results are works that take the 2D medium to a new level. She teaches the techniques in her Sedona, AZ and Shoreline, WA studios. Waale exhibits her works in several galleries in the Western U.S. They also hang in private collections throughout North America and Europe.